Wedding programs are not entirely mandatory for every marriage, but there are some cases wherein such program is much needed especially if you are about to hold a traditional, religious wedding and that the guests that you would be inviting would come from several cultures and beliefs. If you are going to have a Catholic wedding soon, you are encouraged to provide a Catholic wedding program that will help you in making sure that your guests, especially those who are not familiar with the Catholic liturgy, can still fully and actively participate during your wedding ceremony. When it comes to creating any design material for the very first time, keeping things simple is the best and safest way to go in order for your first attempt to be successful. However, it is in this case that the quality of the material gets compromised since you are just solely hell-bent on making it simple. 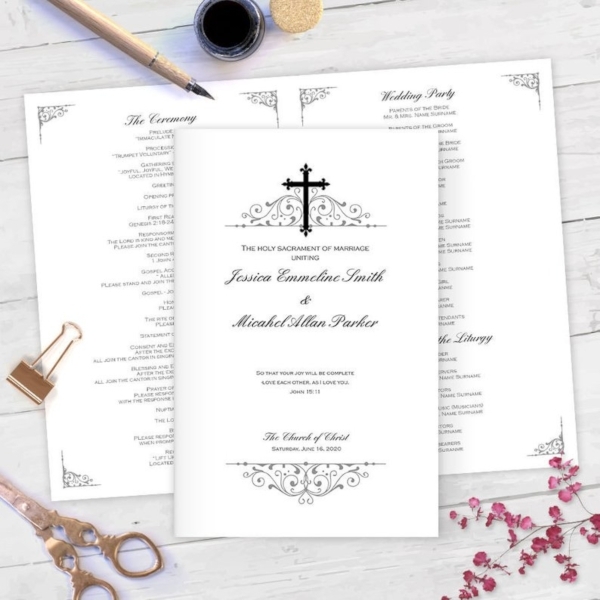 But if you would take a look at this given Catholic wedding program template, you will realize that it is possible for you to create a wedding program that has an elegant and well-thought-out design even if it was simply done. But if you have a difficult time coming up with simple and elegant design, worry no more because you can just make use of this template for your own use. You can also edit this using any editing software program of your choice should you want it to personalize it further. Sure, wedding programs can serve as a wedding souvenir for your guests to have as a memento of the momentous day of your life. But let’s be honest, not all of them are willing to bring bulky and thick Catholic wedding programs right after your wedding reception. And obviously enough, you would also find it a hassle to create and edit a really thick wedding program that would most probably consist of unnecessary texts that your guests would find unessential. 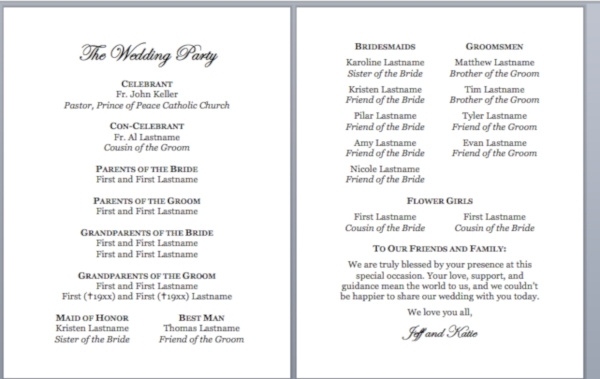 If you are torn between avoiding such a situation and still wanting to provide a wedding program to your guest, you may opt for this flat Catholic wedding program that just contains a single sheet. Despite its limited space for your texts, it has a ready-made layout that would only allow you to incorporate the important details that all your guests need to know during your wedding ceremony. If your wedding follows a specific theme, it is best that you should follow that and even reflect the theme in every single aspect of your wedding. For example, you have a minimalist theme for your wedding. And since it is minimalist, it will look good if your wedding invitations, wedding save-the-dates, wedding accents and decorations, and even your bride’s maids’ gowns would mainly consist of minimal colors such as white, gray, and black. One aspect that you should also be applying in your wedding’s theme includes your Catholic wedding program. 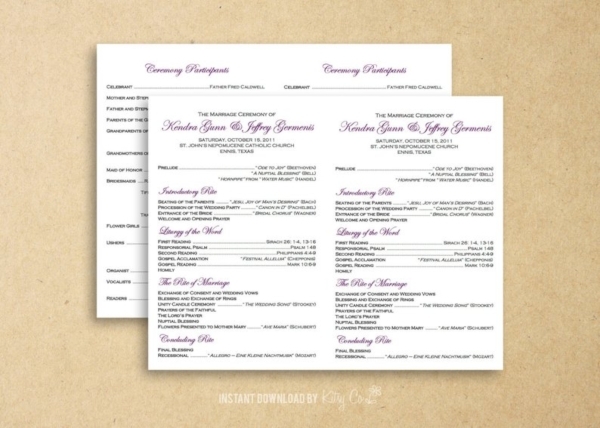 We have provided here a wedding program template that has greenery and the color gold as its dominant design. This template is perfect if you have planned a Bohemian-themed wedding because you will no longer have to edit its layout drastically. And if not, you can still easily edit this template in a way that it will still suit your wedding plans. The Catholic church prefers that couples should be wed in their parish church rather than holding wedding ceremonies outdoors. This is because of the fact that the church would like to emphasize the sacredness of the sacrament of marriage by requiring such ceremony to be celebrated in the church. In short, the church encourages couples to marry inside a Catholic church where they can demonstrate their faith as part of their new life together as a couple right from the very beginning of their married life. And if you want to strictly follow this, this means that there is no beach wedding or garden wedding for you. However, if you cannot bring your wedding ceremony outside of the church, why not bring it inside the church? If you want to hold a garden wedding, it is possible that you will fill the church with flowers and make your entire wedding theme centered around flowers so you can have the best of both worlds. 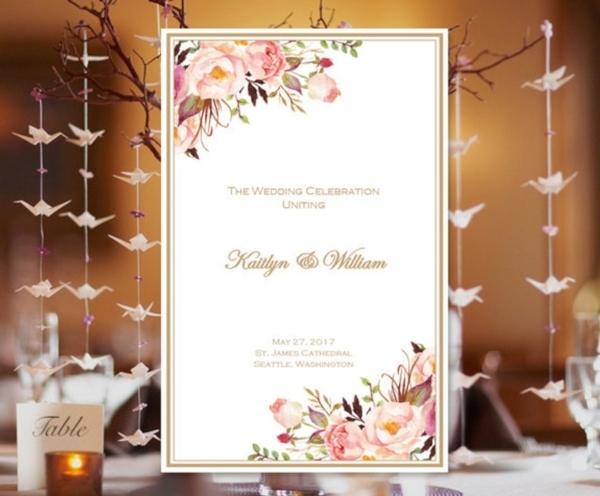 Keeping things simple for your Catholic wedding program is the best and safe way to go especially if it is still your first time designing a wedding program of your own. 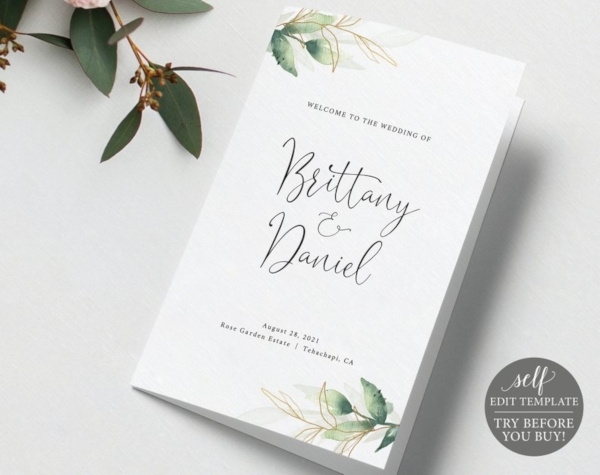 Take a look at this given example and take some notes down on how to just keep things simple without having to worry with a lot of unnecessary design and text elements that your guests would not be needing at all during the wedding program. The only important thing that you must observe is that your wedding program contains the necessary contents that every wedding programs must have which is often the wedding order of service.